A visitor to Macau cannot miss the confluence of Mediterranean style on the Chinese coast. From the grand baroque churches to narrow cobbled lanes, from Vegas-style casinos to shopping avenues, a tour of Macau offers it all! 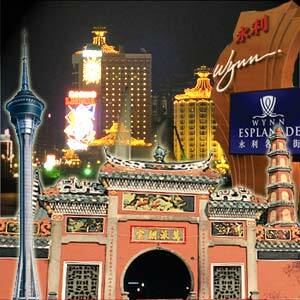 The gambling destination of the East, Macau casinos are a popular tourist draw. The casinos of Macau are an integral part of its economy. A blend of Oriental and Western cultures, a Macau vacation sure promises a peek into heritage buildings and museums, Macanese cuisine and oriental charm. Check out typical Macau weather and Macau hotel and flight information so as to plan ahead. Walking tours of Macau allow you a glimpse of the colonial charm of Macau. Macau is such a small place that most Macau tours can be done on foot. A walk down the San Ma Lo or Avenida de Almeida Ribeiro offers you a glimpse of historical and cultural locations, typical shop houses with wrought iron balconies and cobbled pathways. The busy downtown area of Largo do Senado is choc a bloc with jewelry stores, curio markets and other shopping opportunities. The outlying islands of Taipa and Coloane are scenic and offer a tranquil ambience. While on a tour of Macau, don't miss the Bamboo Bay and Hac Sa Bay. You can notice Portuguese architecture in the Leal Senado Building and the Holy House of Mercy. You can plan a vacation to Macau during the Dragon Boat Festival and watch this spectacular event. Catch the Macau Arts festival in May, an extravaganza of music and theater performances. A vacation to Macau in September allows you be part of the Chinese Festival of Mid-Autumn with candles and colorful lanterns and moon cakes. Since Macau is located on the seven hills, it offers a panoramic view of the South China Sea. You can explore Macau by taxis or bicycles. Take in a volcano ride at Fisherman's Wharf or a bungee trampoline. Fisherman's Wharf houses a variety of restaurants and bars. You can visit the Nam Van Lake Cybernautic Fountain where you can see the special laser show and music show. The A-Ma temple, Ruins of St. Paul's, Macau Maritime museum and the Senate are other places of tourist interest. Take a leisurely walk through the Lou Lim Ieoc Garden. Gambling tourists to Macau can try their luck at most Western games as well as Eastern games of chance. The big casinos are located at the floating Macau palace, Hyatt Regency Macau and Hotel Lisboa. Macau Museum is located at Monte Fort and is home to objects that represent the cultural traditions of Macau. Temple of the Lotus: No tour of Macau is complete without a visit to this intricately carved temple with a lotus-filled pond, frieze of dragons and iron brazier. Canidrome: The Canindrome is the only Greyhound racing facility in Asia. The island territory of Macau is a popular vacation destination with holiday makers, casino goers and heritage and cultural holiday seekers. Macau is a fusion of Asian and European cultures. With its borders with Guangdong Province, Macau is about 60 km from Hong Kong and 145 km from Guangzhou. Most of the population of Macau is Chinese with a sprinkling of Portuguese and other Europeans. Winters in Macau are cold with temperatures dropping to 10 degree C and below. Summers can are usually hot and rainy. Expect thunderstorms and heavy rains during May to September. Macau airport is on Taipa Island and has international flights from several destinations such as Bangkok, Beijing, Brussels, Danang, Ho Chi Minh City, Kaohsiung, Kuala Lumpur, Lisbon, Pyongyang, Seoul, Shanghai, Singapore, Taipei and other cities in China. The Ferry terminals serve as a landing spot for catamarans and sailboats from Hong Kong and China. Macau is a great shopping destination, be it for luxury items, silk clothing or electronic goods. Check out porcelain tableware, vases and novelty items. You can pick up fine ceramics at reasonably low prices at Macau's Rua de São Paulo and Avenida Almeida Ribeiro. Here you can also find handcrafted Chinese goods. While on a Macau tour, you can select fine varieties of Chinese tea. Walk down Avenida Horta e Costa and you can browse through shops selling jewelry, Chinese curious and even foodstuff such as dried meat and seafood. Dried sharks, mushrooms, shrimps, scallops and abalone are available aplenty. Don't miss the traditional cookies and egg tarts (Pastéis de Nata). Macanese cuisine is a blend of Chinese and other Asian flavors combined with Portuguese influence.